Weidmüller Omnimate Data range of USB jacks offers variety of PCB mountable Type A USB 2.0 and 3.0 connectors. Available with THT or TRH solder connections, various solder pin lengths, vertical (180°) or horizontal (90°) design option and other variables to meet your requirements. As with all Weidmüller connector, the brand is a guarantee of high quality and reliable connectivity. The USB2.0A R1V 2.5N4 TY BK PCB plug-in jack connector from the Weidmüller Omnimate data range. Offers a universal serial bus 2.0 type A connector which meet the requirements for high resistance and provide reliable connectivity. The USB connector from Weidmüller features 4 poles with an outgoing elbow of 180° and with an operating temperature range of −20°C to +60°C. 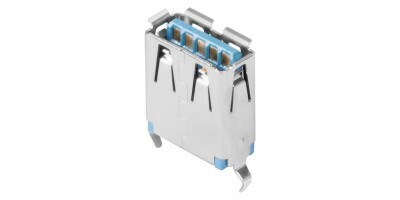 The USB2.0A S1H 1.4N4 TY BK connector system is part of the Omnimate Data range from Weidmüller, which are packed in a tray (TY) or on a roll (tape-on reel, RL) and the reinforced gold layer which is for improved corrosion protection. The USB2.0A S1H 1.4N4 TY BK PCB plug-in jack connector from the Weidmüller Omnimate data range. Offers a universal serial bus 2.0 type A connectors which meet the requirements for high resistance and provide reliable connectivity. The USB connector from Weidmüller features 4 poles with an outgoing elbow of 90° and with an operating temperature range of −40°C to +60°C. The USB2.0A T1H 2.5N4 TY BK PCB plug-in jack connectors from the Weidmüller Omnimate data range. Offers a universal serial bus 2.0 type A connector which meet the requirements for high resistance and provide reliable connectivity. The USB connector from Weidmüller features 4 poles with an outgoing elbow of 90° and with an operating temperature range of −20°C to +60°C. The USB2.0A T1H 2.5N4 TY BK connector system is part of the Omnimate Data range from Weidmüller, which are packed in a tray (TY) or on a roll (tape-on reel,RL) and the reinforced gold layer which is for improved corrosion protection. The USB2.0A T1V 2.5N4 TY BK PCB plug-in jack connector from the Weidmüller Omnimate data range. Offers a universal serial bus 2.0 (super speed): Type A connector which meet the requirements for high resistance and provide reliable connectivity. The USB connector by Weidmüller features 4 poles with an outgoing elbow of 180° and with an operating temperature range of −40°C to +60°C. The USB2.0A T1V 2.5N4 TY BK connector system is part of the Omnimate Data range from Weidmüller, which are packed in a tray (TY) or on a roll (tape-on reel, RL) and the reinforced gold layer which is for improved corrosion protection. The USB3.0A R1V 2.0N3 RL BL PCB plug-in jack connectors from the Weidmüller Omnimate data range. Offers a universal serial bus 3.0 (super Speed) type A connectors which meet the requirements for high resistance and provide reliable connectivity. The USB3.0A R1V 2.0N3 RL BL by Weidmüller features 8 poles with an outgoing elbow of 180° and with an operating temperature range of −55°C to +85°C. The USB3.0A R1V 2.0N3 RL BL connector system is part of the Omnimate Data range from Weidmüller, which are packed in a tray (TY) or on a roll (tape-on reel, RL) and the reinforced gold layer which is for improved corrosion protection. The USB3.0A R1V 3.0N2 TY BL PCB plug-in jack connectors from the Weidmüller Omnimate data range. Offers a universal serial bus 3.0 (super speed): Type A connectors meet the requirements for high resistance and provide reliable connectivity. The USB connector from Weidmüller features 8 poles with an outgoing elbow of 180° and with an operating temperature range of −40°C to +85°C. The USB3.0A R1V 3.0N2 TY B connector system is part of the Omnimate Data range from Weidmüller, which are packed in a tray (TY) or on a roll (tape-on reel, RL) and the reinforced gold layer which is for improved corrosion protection. The USB3.0A T1H 2.3N4 TY BL PCB plug-in connectors from the Weidmüller Omnimate data range. Offers a universal serial bus 3.0 (super Speed) type A connectors which meet the requirements for high resistance and provide reliable connectivity. The USB connector from Weidmüller features 9 poles with an outgoing elbow of 90° and with an operating temperature range of −25°C to +85°C. The USB3.0A T1H 2.3N4 TY BL connector system is part of the Omnimate Data range from Weidmüller, which are packed in a tray (TY) or on a roll (tape-on reel, RL) and the reinforced gold layer which is for improved corrosion protection.